Summer solstice —June 21st— is in many religions associated with a celebration or a commemoration of nature and Zoroastrianism makes no exception. 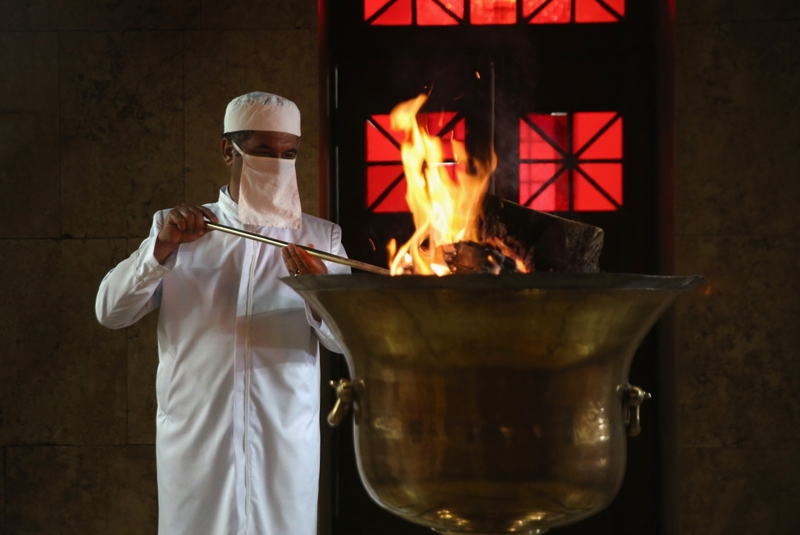 Maiδyōi.šam, literally “midsummer”, is the name given to this day included inside the six Gāhānbār of the Zoroastrian religion. Zoroastrian fire temple interior, original image here. Gāhānbār, Middle Persian word, were the festivals celebrated at the end of the six seasons inside the Zoroastrian calendar. In the Avestan sources they appear mentioned, both seasons and festivals, as yāirya ratavō, literally meaning “yearly time”. Later on, with the Middle Persian transformation, their meaning changed into “appointed time” or “proper time” . According to Mary Boyce, those festivals show an ancient tradition that probably comes from earlier times, before Zoroastrian arose, and thus they will be linked to animistic and Indo-Iranian cults practiced by that epoch. Each of the six Gāhānbār commemorated the creation of one of the six sacred elements by Ahura Mazda, being in order the sky, the waters, the earth, the plants, the animals and humanity. Finally a special day is added, Nowrūz, which celebrated creation of fire, the seventh and most powerful of all elements. Maiδyōi.šam Gāhānbār was the second on the list of the six events and was marked by a natural phenomenon as the summer solstice, thus being linked to the power of the sun to control passing of time and its division in daily tasks. In this day creation of the waters was celebrated as they were of high importance in Zoroastrianism for being a life-giving element —read more about Anāhitā, Zoroastrian divinity of Waters, by clicking here. 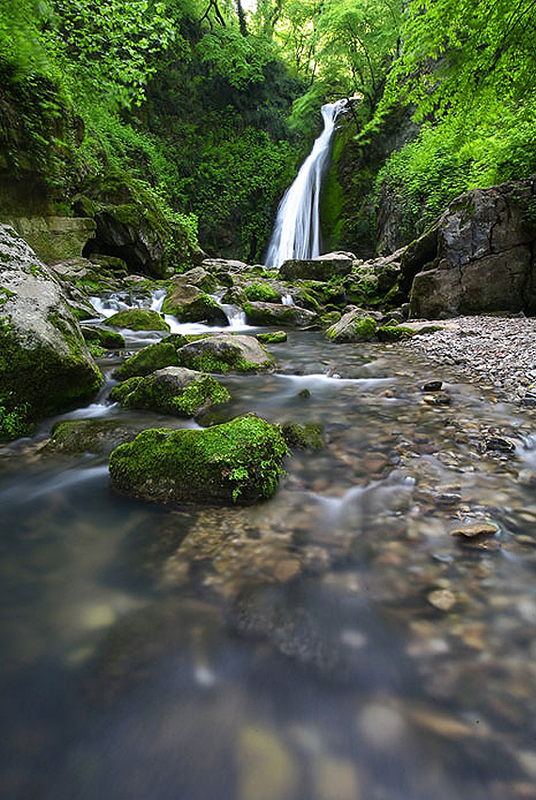 Shir Abad waterfall in Iran. Original image here. Maiδyōi.šam Gāhānbār was considered a festival obligatory of observation and all works but the strictly necessary ones were forbidden. Preparations were made in advance by sweeping and carefully cleaning the house and by making sure everybody will wear their best clothing for the occasion. Traditionally people attended the first part of the religious services to recite prayers, as they will be solemnized by the priests. If unable to do this, they at least shared the food blessed then. In those sacred days people tried to be as kind and cheerful as possible as joyfulness was considered a great virtue in Zoroastrianism. Therefore, sharing food and drink in big reunions, talking, singing songs and storytelling were very important actions in every Zoroastrian festival. 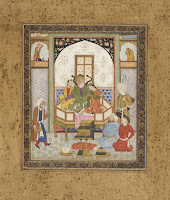 Those banquets could be organised inside an only family or, in the case of the Gāhānbār, including the whole community where everybody contributed. 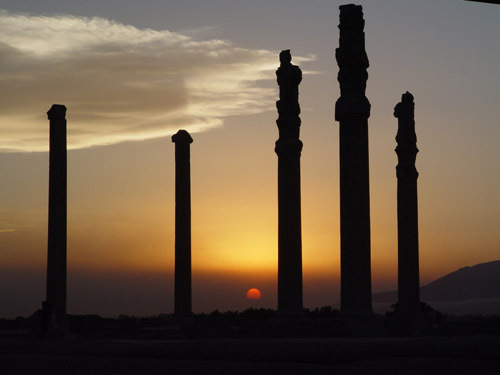 Persepolis at sunrise. Original image here.